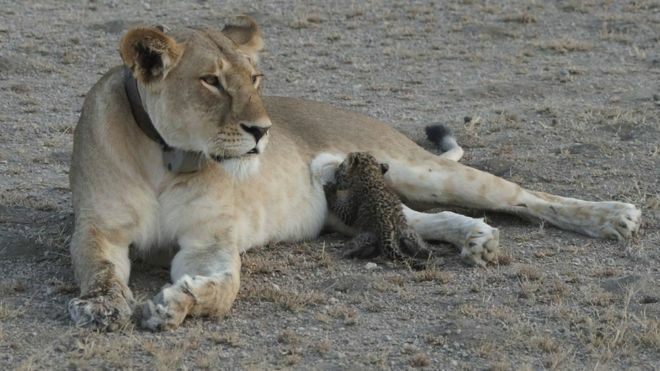 A baby leopard can’t change his spots, but this lioness doesn’t seem to mind. 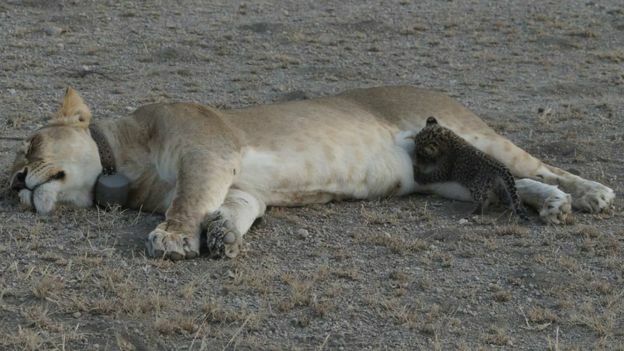 These beautiful pictures are the first ever taken of a wild lioness nursing a cub from a different species – an extremely rare event. The pair were spotted by Joop Van Der Linde, a guest at Ndutu Safari Lodge in Tanzania’s Ngorongoro Conservation Area. The scene is the Serengeti; the attentive mother, five-year-old Nosikitok. The lioness has a GPS collar fitted by Kope Lion, a conservation NGO, and three young cubs of her own – born around the 27-28 June. Dr Luke Hunter, President and Chief Conservation Officer for Panthera, a global wild cat conservation organisation which supports Kope Lion, told the BBC the incident was “truly unique”. “It’s not something that I’m aware has ever happened before between large cats like this,” he said. “We know there are cases where lionesses will adopt other lion cubs… But this is unprecedented. Most lionesses would normally kill a baby leopard if they found one, seeing just another predator in a competitive food-chain. 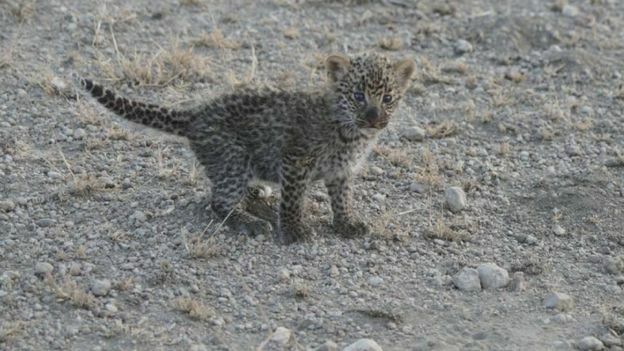 Dr Hunter says Nosikitok has cubs the same age as the young leopard – two to three weeks. 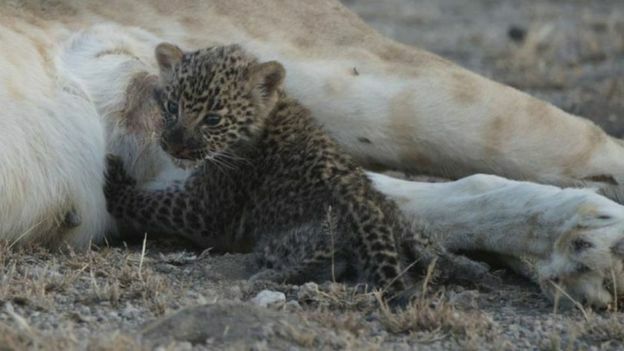 She was around a kilometre from her den, where her own cubs are hidden, when she found the spotted substitute. 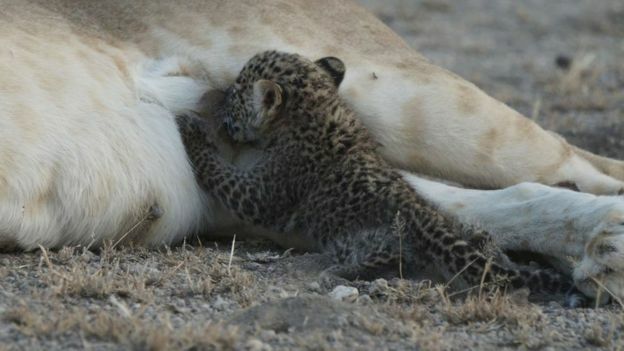 “She’s encountered this little cub, and she’s treated it as her own. She’s awash with maternal hormones, and this fierce, protective drive that all lionesses have – they’re formidable mums,” the lion expert notes. It is not clear yet where the baby leopard’s mother is, or if the lioness will try to adopt it full-time. The local safari lodge say there is a resident female leopard there who almost certainly has cubs. And as Nosikitok’s pride are unlikely to prove as indulgent as she is, the best outcome for the leopard would be a safe return to mum. Dr Hunter says his team are on tenterhooks to see what comes next.